Situated on the 2nd floor with a large balcony. Ideal for both couples and families alike. Fitted with new kitchen, the apartment also includes 32'' Flat screen TV, a small selection of books and games, iron with ironing board and a hair dryer. 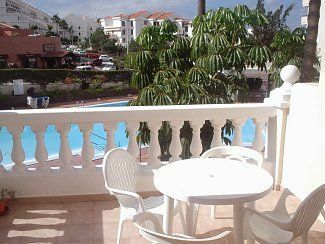 The balcony is ideally located over the pool which gets the sun all year round. The community offers a 24 hour reception, poolside bar and heated pool. There are games and events regularly arranged by the community. Bath with shower. Separate WC. Recently re-furbished to a high standard the living area comprises of a double bed-settee (with detachable single bed), TV, video, Hi-Fi, DVD player, books and children's games. Electric oven, 4 ring electric hob, fridge/freezer, microwave oven, toaster, kettle, pot, pans and utensils. Notes on accommodation: Single bed from bed settee can be easily situated into the large bedroom area, ideal for 2 adults and 1 child. Outside: Well maintained pool and pool area. Shared, heated swimming pool. Superb pool bar on the complex, supermarket 20 yards away. Cleaning / Towels / Linen / Maid service: Linen provided and changed weekly. Property cleaned on a weekly basis. Bath towels not provided. Loved the apartment as it had nearly everything you would need to have a great stay here. Clean large 1 bed apartment. Satellite tv, cooker and 4 ring hob unusual as most apartments generally have 2 solid ring hobs which are ancient nowadays. Large balcony overlooking the pool with furniture. On 3rd floor which is easily accessible. Petty thing, blackout curtains in the bedroom would have been a bonus as its very bright in the mornings (not their fault). Overall a great place to stay at a reasonable price, would stay there anytime if I could book the place again. Beach and harbour front 15 mins walk. Tenerife South airport 15 mins by car. Taxi fare from airport approx 18 euros. The livelier resort of Las Americas only 1 mile away. Los Cristianos bus terminus 10 mins walk away. Booking Notes: Bookings confirmed by 50 pound deposit. Final payment required 6 weeks prior to arrival. Changeover Day: Primarily Friday changeover. Notes on prices: Prices are for the property per week in UK pounds. We will be happy to quote for long lets. Please contact us for further details.